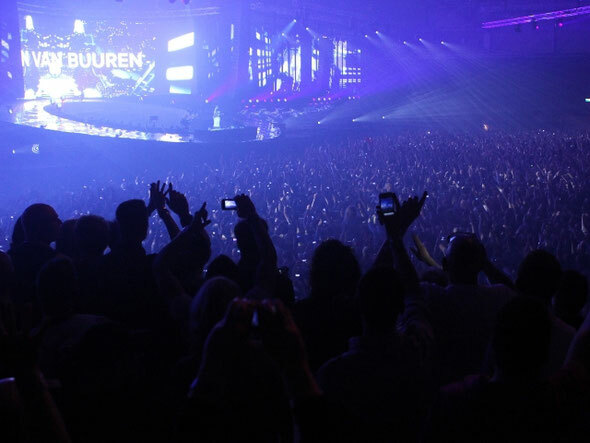 The official A State of Trance 550 world tour of Armin van Buuren seems to have been a great success. Last Saturday, the final edition of the six-event tour across five different countries took place in the Dutch city of Den Bosch. Gathering 30,000 dance lovers to the sold-out event in the Brabanthallen, it was the crown to months of hard work for the award-winning DJ. Social media stats show just how much of a global happening A State of Trance 550 was. According to figures released by Armada, with each edition broadcasted live via www.astateoftrance.com and over 50 global radio stations, the party didn’t limit itself to the cities of London, Kiev, Moscow, Los Angeles, Miami or Den Bosch, but turned into a global happening. During the four weeks, more than a million page views came in on the website. More than half a million tweets were sent using the hash tag #ASOT550 and Armin’s Twitter, Facebook and other social media saw the numbers rising quickly. A State of Trance fans tuned in from all across the globe, from Paraguay and Australia to Mexico, Iran, Russia, South-Africa, Egypt and beyond. Armin van Buuren: ”A State of Trance 550 has been an absolute highlight in my career. After the edition of 500, I wasn’t sure if we could top it, but we sure did! The energy of the crowd, the support of people tuning in from all across the globe and the entire A State of Trance 550 team working incredibly hard to make this tour unforgettable, we nailed it! THANK YOU! I hope to see all of you in Ibiza!” Now that the A State of Trance 550 world tour is over, it’s only a few months wait until Armin kicks off his residency at club Privilege in Ibiza. From June 25th, A State of Trance nights land in the world’s biggest club for 14 events.